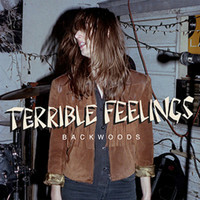 Man In Decline Records - Terrible Feelings - "Backwoods" 7"
Terrible Feelings - "Backwoods" 7"
Place their sound somewhere in the wastelands between the Wipers, Redd Kross, Ebba Green and The Murder City Devils. The band has, to date, released three 7"s and one full-length album. They've embarked on no less than five full European tours and two US tours (one on each coast). They've shared stages with bands such as Jeff The Brotherhood, White Lung, Imperial State Electric, Fucked Up, The Raveonettes and The Babies, and were handpicked by none other than Refused as support in both Europe and Sweden on their final tour. Musically, Terrible Feelings has been described as proto punk, dark power pop and gloomy surf, with a tint of both country and '70s hard rock. All descriptions are correct. It's rock 'n' roll. 7" includes digital download.